• Both English and Metric markings with separate background colors (white and yellow). • Light weight and collapsible at 5 lbs it's easily a one person operation. • Yellow Carry case for high visibility and a shoulder strap. 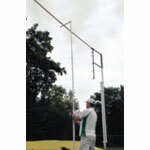 • Measures from 4'9” up to 20' 4” or in metric from 1.45m to 6.21.